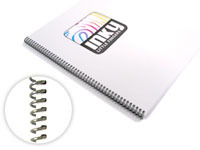 Spiral bound documents for use as manuals, books etc. Printed digitally with great prices and rapid service for whatever quantity you need. You can choose black & white printing, full colour printing, or a mixture of both. Spirals are pretty flexible, so for most sizes you can have the long edge or the short edge bound. The exception is A3, where you can only have the short edge bound. There are a huge variety of colours that we can special order in for you. Colours like bright pink, red, several shades of blue and even neon "dayglow" colours. Contact the helpdesk if you'd like a special standard colour. These do cost a little extra, especially if you only want a small quantity bound and they will add a few days to the lead time. You can't mix and match the paper within the document as standard. If this is something that you would like to do, please call the helpdesk on 01452 751900. Be aware that unless your order is for at least 100 books, this is an expensive option to set up. Delivery is to a UK mainland postcode. We can also deliver to many other EU destinations, but you will need to contact the helpdesk to discuss this. Delivery is normally the next working day AFTER the job is printed (non guaranteed). If you want a Saturday delivery, call the helpdesk to get that cost added to your order. We classify Monday-Friday as working days, Bank Holidays are not working days. Delivery is to a UK mainland postcode. We can also deliver to many other EU destinations, but you will need to contact the helpdesk to discuss this. Fill in the full postcode of where this is being sent to so that we can work out a price and whether we deliver to this area. You'll fill in the full delivery address later once you've placed your order. This wallpaper is printed using HP Latex printing technology, which is especially suitable for indoor use as it exhibits none of the unpleasant outgassing that occurs with print manufactured using solvent based equipment. This wallpaper is odour free and safe from day one. The print quality is very high and the colours are vibrant, making it especially suitable for wallpaper. This product is expected be lightfast for up to 3 years in direct sunlight and significantly longer outside of direct sunlight. Inky uses genuine HP Latex inks. Anyone can order printed wallpaper from here. Installation is pretty straightforward but preparing the artwork does require some fairly basic computer skills. If you're not comfortable using a computer, this is probably not for you. It's really pretty straightforward. If you are a competent DIYer, can follow instructions and can hang normal wallpaper, this should be no problem for you. We do provide installation instructions that you can read before ordering. Yes we do, although this is primarily for commercial installations. Please contact the helpdesk if you'd like to chat more about this. Not yet! We're looking into potential solutions that allow you to visualise your wallpaper mural in place, with the correct dimensions, windows, doors etc., but that's unlikely to arrive before late 2012. Sorry, not through this service! This service is for printing your own design, or designs and images that you have the appropriate license for (for instance from a stock photography web site). We do not currently offer any licensed images through this service and will never knowingly print any copyrighted images. PDF, TIFF or JPEG. A PDF is recommended and it's important to embed your fonts when creating your PDF. Please be realistic about what to expect from your file! You may have a much higher resolution camera, in which case you need to do a bit of math (you can use the pixels per cm above as a rough guide) to work out what size print you can achieve. Does this mean that wallpaper printed at 20 pixels per cm or below will look terrible? Not at all, but you should know what to expect. We've blown images up to wall size as low as 12 pixels per cm and they look fantastic when viewed from a short distance. Up close the image looks pixelated and blurred of course! It doesn't matter if we have to enlarge or reduce your artwork to fit. We'll do that automatically for you if it's not the right size on a "best fit" basis. If you are sending us artwork that you want blown up to size, it's a good idea to send us something with the same "aspect ratio" as the area you want, otherwise you'll end up with some parts cropped off. For example, 450mm high x 450mm wide can be enlarged to 1800mm wide x 1800mm wide with no cropping, but enlarging 400mm high x 450mm wide to 1800mm wide x 1800mm wide means that some of the width will have to be cropped off to make it fit. If in doubt, have a chat with the helpdesk. This only applies for wall to ceiling wallpaper, not for murals. Because walls are rarely plumb and straight, it's best to have a little bit of extra printed wallpaper to play with top and bottom and a little extra on each side. How much is up to you, but in an ideal world, 50cm all round will help fix a multitide of sins. If you've got straight walls and are confident in your paper hanging accuracy, then you can reduce this down, but in our opinion anything less than 25mm is asking for trouble. Of course, that's no problem. Have a chat with the helpdesk so that we can discuss the best way of laying out your artwork. For an overview of the order process, click on the big blue question mark button above. These prices are just for the printing, but we can do the complete artwork for you as well. You'll need to have a chat with the helpdesk to work out a price and we'll add that to your order. Check out Help - Is There Anything Inky Won't Print?